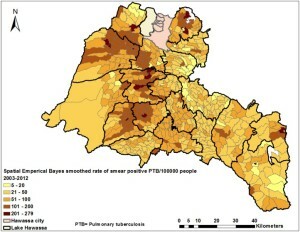 Hamusse S, Demissie M, Teshome D, Hassen MS, Lindtjorn B: Prevalence and Incidence of Smear-Positive Pulmonary Tuberculosis in the Hetosa District of Arsi Zone, Oromia Regional State of Central Ethiopia. BMC Infect Dis 2017, 17:214. Background The real burden of smear-positive (PTB+) and bacteriologically confirmed tuberculosis (BCTB) in Ethiopia is not known. 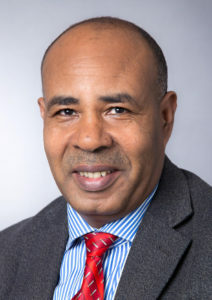 Thus, the aim of this community-based study was to measure the prevalence and incidence of tuberculosis in the Hetosa District of Oromia Region, Ethiopia. Methods First, a population-based cross-sectional survey was conducted on a total of 33,073 individuals aged ≥ 15 years to determine the prevalence of PTB+ and BCTB cases. Then, in order to determine the incidence, a prospective follow-up was carried out on 32,800 individuals found to be either free from symptoms suggestive of TB (SSTB) during the baseline survey or had symptoms suggestive of TB but yielded negative bacteriological examination results. We identified 1,041 presumptive TB cases at the baseline survey, and 1,468 in the follow-up study. Each participants with cough of more than two weeks were provided spot and morning sputum samples for acid-fast bacilli sputum microscopy and culture. Results At the baseline survey, 43 BCTB cases were identified. Thirty six of these were both smear- and culture-positive while seven were only culture-positive. In the follow-up study, however, 76 BCTB cases were diagnosed and 70 of these were found to be both smear- and culture-positive while six were culture-positive only. The adjusted prevalence of PTB+ and BCTB in the study area was 109 and 132/100,000 persons, respectively. Moreover, the incidences of PTB+ and BCTB were 214 and 232/100,000 persons per year (py), respectively. The ratio of the passive to active case finding was 1:0.96 (45/43). For every TB case identified through the existing passive case diagnosis, there was an almost equal number (0.96) of undiagnosed infectious TB cases in the community. A family history of TB contact was independently associated with a high risk of TB (TB prevalence, AOR, 13; 95% CI: 6.55–15.33) and (TB incidence, aIRR 4.11, 95% CI: 2.18–7.77). Conclusions and recommendations The prevalence and incidence of smear-positive and bacteriologically confirmed TB cases were high in the study area. For every case of smear-positive TB receiving treatment, there was an almost equal (0.96) number of undetected infectious bacteriologically confirmed TB case in the community. The high proportion of undetected infectious TB cases in the community could possibly be due to the sub-optimal performance of Directly Observed Treatment Short-course (DOTS) in detecting 70% of infectious TB cases, as well as attaining a cure rate of 85% in the study area. Family history of TB contact has substantaially increased the risk of developing the disease, and there is a need to improve ways of identifying TB cases and intensify mechanisms of tracing contacts among household members of PTB+ cases. Background: Multidrug-resistant tuberculosis (MDR-TB) drugs which is resistant to the major first-line anti-TB drugs, Isoniazid and Rifampicin, has become a major global challenge in tuberculosis (TB) control programme. However, its burden at community level is not well known. Thus, the aim of study was to assess the prevalence of primary and secondary resistance to any first line anti-TB drugs and MDR TB in Hitossa District of Oromia Regional State, Central Ethiopia. Methods: Population based cross- sectional study was conducted on individuals aged ≥15 years. Those with symptoms suggestive of TB were interviewed and two sputum specimens were collected from each and examined using Lowenstein-Jensen (LJ) culture medium. Further, the isolates were confirmed by the Ziehl-Neelsen microscopic examination method. Drug susceptibility test (DST) was also conducted on LJ medium using a simplified indirect proportion method. The resistance strains were then determined by percentage of colonies that grew on the critical concentration of Isoniazid, Streptomycin, Rifampicin and Ethambutol. Results: The overall resistance of all forms of TB to any first-line anti-TB drug was 21.7 %. Of the total new and previously treated culture positive TB cases, 15.3 and 48.8 % respectively were found to be a resistant to any of the first-line anti-TB drugs. 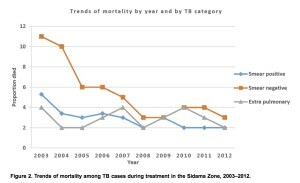 Further, of all forms of TB, the overall resistance of MDR-TB was 4.7 %. However, of the total new TB cases, 2.4 % had primary while 14.3 % had secondary MDR-TB. Resistance to any of the first-line anti-TB drugs (adjusted odd ratio (AOR), 8.1; 95 % CI: 2.26–29.30) and MDR-TB (AOR), 7.1; 95 % CI: 2.6–43.8) was found to be linked with previous history of anti-TB treatment. Conclusions: The study has identified a high rate of primary and secondary resistance to any of the first-line anti-TB drugs and MDR-TB in the study area. The resistance may have resulted from sub-optimal performance of directly observed treatment short-course (DOTS) programme in the detecting infectious TB cases and cure rates in the study area. Anti-TB drug resistance is linked with previous TB treatment. There is a need to strengthen DOTS and DOTS-Plus programmes and expand MDR-TB diagnostic facilities in order to timely diagnose MDR-TB cases and provide appropriate treatment to prevent the spread of MDR-TB in Ethiopia. Dangisso, M. H., et al. (2015). “Accessibility to tuberculosis control services and tuberculosis programme performance in southern Ethiopia.” Glob Health Action 8: 29443. BACKGROUND: Despite the expansion of health services and community-based interventions in Ethiopia, limited evidence exists about the distribution of and access to health facilities and their relationship with the performance of tuberculosis (TB) control programmes. We aim to assess the geographical distribution of and physical accessibility to TB control services and their relationship with TB case notification rates (CNRs) and treatment outcome in the Sidama Zone, southern Ethiopia. DESIGN: We carried out an ecological study to assess physical accessibility to TB control facilities and the association of physical accessibility with TB CNRs and treatment outcome. We collected smear-positive pulmonary TB (PTB) cases treated during 2003-2012 from unit TB registers and TB service data such as availability of basic supplies for TB control and geographic locations of health services. We used ArcGIS 10.2 to measure the distance from each enumeration location to the nearest TB control facilities. A linear regression analysis was employed to assess factors associated with TB CNRs and treatment outcome. RESULTS: Over a decade the health service coverage (the health facility-to-population ratio) increased by 36% and the accessibility to TB control facilities also improved. 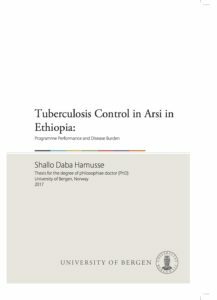 Thus, the mean distance from TB control services was 7.6 km in 2003 (ranging from 1.8 to 25.5 km) between kebeles (the smallest administrative units) and had decreased to 3.2 km in 2012 (ranging from 1.5 to 12.4 km). In multivariate linear regression, as distance from TB diagnostic facilities (b-estimate=-0.25, p<0.001) and altitude (b-estimate=-0.31, p<0.001) increased, the CNRs of TB decreased, whereas a higher population density was associated with increased TB CNRs. Similarly, distance to TB control facilities (b-estimate=-0.27, p<0.001) and altitude (b-estimate=-0.30, p<0.001) were inversely associated with treatment success (proportion of treatment completed or cured cases). CONCLUSIONS: Accessibility to TB control services improved despite the geographic variations. TB CNRs were higher in areas where people had better access to diagnostic and treatment centres. Community-based interventions also played an important role for the increased CNRs in most areas. Dangisso, MH, Datiko DG and Lindtjørn B. (2015). “Low case notification rates of childhood tuberculosis in southern Ethiopia.” BMC Pediatr 15(1): 1-10. Background Childhood tuberculosis (TB) is a public health concern causing considerable mortality. However, control of childhood TB receives little attention. The control efforts could be inadequate because of challenges associated with difficulties in diagnosing the disease in children. Understanding the burden of the disease among children is important to assess the ongoing transmission of the disease in a community and improving TB control efforts. This study was carried out to assess TB case notification rates (CNRs) and treatment outcomes in children aged less than 15 years over a ten-year period. Methods Data were collected from unit TB registers from all health facilities providing TB treatment in the Sidama Zone in Ethiopia. We analysed the CNRs and treatment outcomes by age category, gender, and place of residence. We used logistic regression analysis to identify factors associated with treatment outcomes and to control for confounding. Results A total of 4,656 cases of children less than 15 years of age were notified as diagnosed and treated for TB, constituting 13 % of all notified TB cases in the study area. The mean CNRs per 100,000 children less than 15 years were 30 for all new cases of TB, 28 for rural cases, 67 for urban cases, 28 in boys, and 32 in girls. The proportions of treatment success were 82 % for new and 77 % for retreatment cases for the entire study period and increased to 93 % for new cases in 2012 (X2 trend, P < 0.001). Children less than five years old had a lower treatment success [adjusted odds ratio (AOR) 0.64 (95 % CI, 0.52-0.80)] and higher deaths [AOR 2 (95 % CI, 1.27–3.12)]. The proportion of children who died during treatment among children in the less than 2-year-old age group was three times higher than children in the 2 year and above age groups [AOR 3.34 (95 % CI, 1.92–5.82)]. 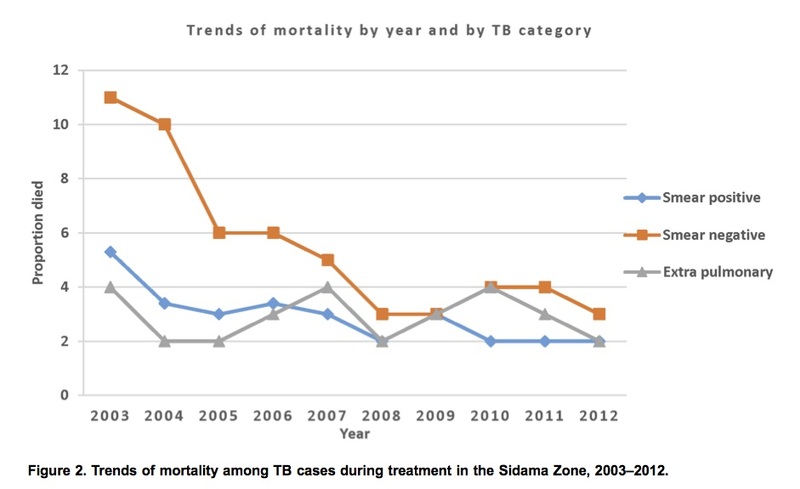 Conclusion The CNRs of childhood TB were low in Sidama. Children less than 5 years old had a higher proportion of deaths. Efforts need to be made to improve the diagnosis and treatment of TB among children. 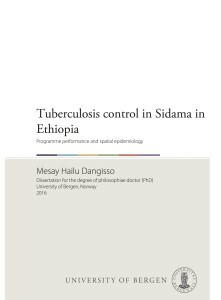 Dangisso MH, Datiko DG, Lindtjorn B. Spatio-temporal analysis of smear-positive tuberculosis in the sidama zone, southern Ethiopia. PLoS One 2015; 10(6): e0126369. BACKGROUND: Tuberculosis (TB) is a disease of public health concern, with a varying distribution across settings depending on socio-economic status, HIV burden, availability and performance of the health system. Ethiopia is a country with a high burden of TB, with regional variations in TB case notification rates (CNRs). However, TB program reports are often compiled and reported at higher administrative units that do not show the burden at lower units, so there is limited information about the spatial distribution of the disease. We therefore aim to assess the spatial distribution and presence of the spatio-temporal clustering of the disease in different geographic settings over 10 years in the Sidama Zone in southern Ethiopia. 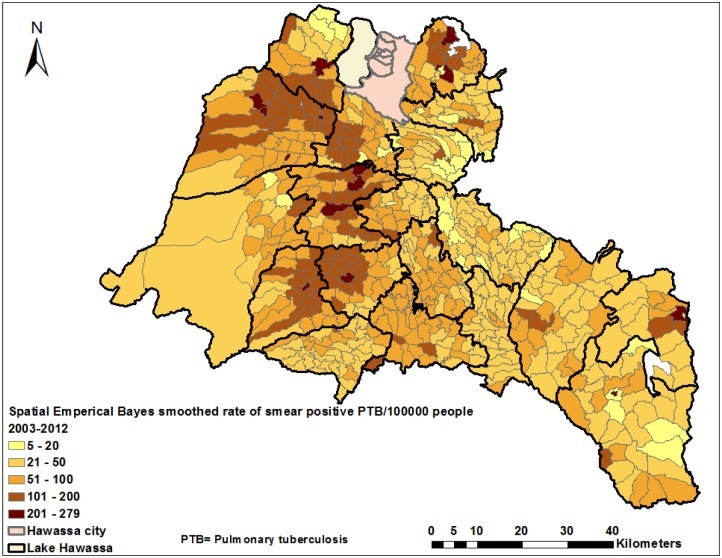 METHODS: A retrospective space-time and spatial analysis were carried out at the kebele level (the lowest administrative unit within a district) to identify spatial and space-time clusters of smear-positive pulmonary TB (PTB). Scan statistics, Global Moran’s I, and Getis and Ordi (Gi*) statistics were all used to help analyze the spatial distribution and clusters of the disease across settings. RESULTS: A total of 22,545 smear-positive PTB cases notified over 10 years were used for spatial analysis. In a purely spatial analysis, we identified the most likely cluster of smear-positive PTB in 192 kebeles in eight districts (RR= 2, p<0.001), with 12,155 observed and 8,668 expected cases. The Gi* statistic also identified the clusters in the same areas, and the spatial clusters showed stability in most areas in each year during the study period. The space-time analysis also detected the most likely cluster in 193 kebeles in the same eight districts (RR= 1.92, p<0.001), with 7,584 observed and 4,738 expected cases in 2003-2012. CONCLUSION: The study found variations in CNRs and significant spatio-temporal clusters of smear-positive PTB in the Sidama Zone. The findings can be used to guide TB control programs to devise effective TB control strategies for the geographic areas characterized by the highest CNRs. Further studies are required to understand the factors associated with clustering based on individual level locations and investigation of cases.